MU students take part in a walk-out on August 26, 2015. Two years ago, graduate students at the University of Missouri found out in an email that their health insurance would be cut. 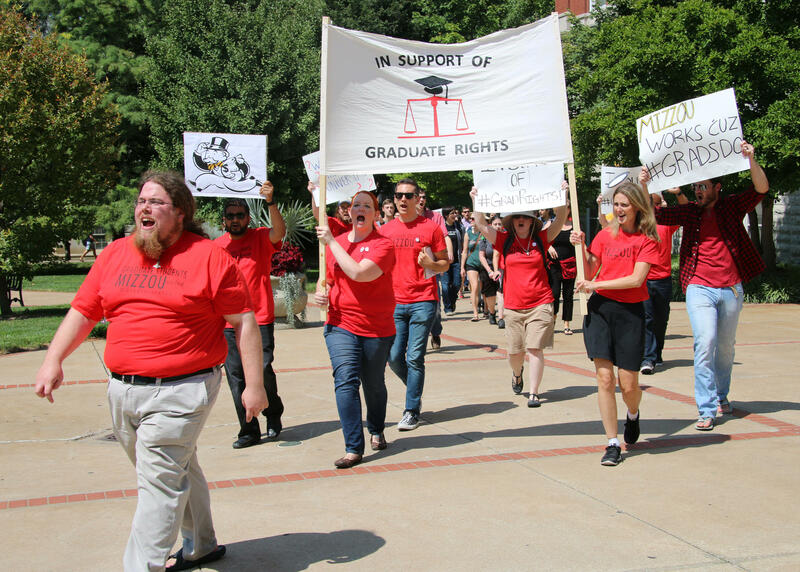 Students began protesting around the issue, eventually creating a group called the Coalition of Graduate Workers. Sarah Senff was a member of that coalition to improve working conditions for graduate students. KBIA’s Elena Rivera spoke with Senff about the organizing in 2015 and what has changed in the past two years for graduate students at MU. Sarah Senff: It was a bunch of people going "There's a problem here and I can do something about that. I am very skilled and articulate and passionate and so I'm going to use those skills to help everyone around me." And so that was--even though that was very stressful, a very moving and empowering moment I think at the University of Missouri for graduate students. It was moving to see our faculty and staff come out with us the day that we walked out that first Wednesday of classes in August of 2015. It was moving to see librarians marching beside us. Right? So, I think it's important to recognize that graduate students through a collective effort have made some important gains, even though there is some ground left to cover. Elena Rivera: And one of those gains is definitely related to stipends, right? Senff: It increased in three thousand dollar increments over two years. And that's an increase from the minimum stipend. People who were making over that didn't necessarily see an increase. So, that was really important in helping raise the quality of life for graduate students who are making at or near the federal poverty level for a single individual. And some of those people were supporting families on the stipend of the federal poverty level for a single individual. Rivera: What was it like to be doing organization around grad rights and then also knowing, “Hey, there's this other big group, Concerned Student 1950, also organizing." And there’s a lot of overlap. There were a lot of grad students in Concerned Student 1950. What did that look like? Senff: It was really interesting to be on the action committee at that time, and responding to a really big direct action kind of movement that was happening on Mizzou's campus. We were literally around the corner from the car where the homecoming parade incident happened. We were waiting for our float to go, not realizing that one of reasons we were waiting so long was because of this protest that was happening at the homecoming parade. So, we tried really hard to be supportive but not get in the way of what they were trying to do. I have learned so much from particularly women of color in this movement who have been doing this work for a very, very long time and not necessarily always getting the recognition for the emotional and political labor that they have been doing. That tends to be pretty invisible. Rivera: So there have been a lot of things that have changed or have updated. What are hoping we'll see in terms of changes in the next couple of years? Senff: Personally speaking on behalf of myself and not on behalf of GSA, I think that a collectively bargained contract is very important for graduate students to be able to plan. We all come to grad school knowing we're going to live on a narrow margin. Right? And so we plan our lives to account for that. And then we need to know that the promises made to us by the university are going to be honored. It's not about getting more. It's about knowing we can count on what was promised.